The super-warm Calinda-D Jacket with Real Fur from Bogner is the perfect blend of outdoorsy and modern. With 750 fill power insulation, 20K waterproofing rating, and 30K breathability rating, it's exceptionally warm for winter wear. This high-quality winter jacket features a removable, zip-out down liner, so you can leave that out on warmer days. Slightly bent arms help encourage a comfortable resting position of the arms, and embroidery on the hood and gold hardware throughout the Calinda-D Jacket give it a luxurious, attention-grabbing design. 750 fill power insulation and a 20K waterproofing rating make this a great choice in cold, winter weather. "Hi, I would like to know if i can remove the fur hood. Thanks a lot, Denise"
"The fur trim is removable on this hood. Hope this information helps. " "Is the jacket red or more of a watermelon colour ir reddy orange ?" "Thank you for your inquiry. The Bogner Calina-D Ski Jacket with Real Fur in the color "hot red print" has an orange tint, this jacket also features a pink, brown, white, and gold abstract winged pattern. We hope this information helps." "Does this jacket have an inside pocket?" "Thank you for your inquiry. 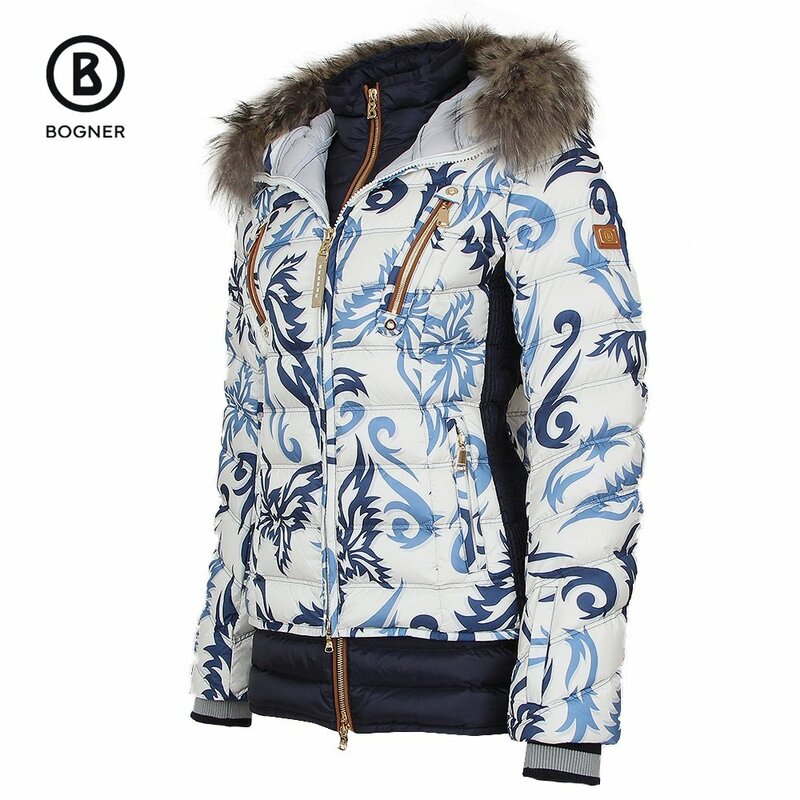 The Bogner Calina-D Ski Jacket with Real Fur does not have any inside pockets. We hope this information helps!" Colours are amazing. Warm stylish and functional.